From the Crawford County Historical Society website. 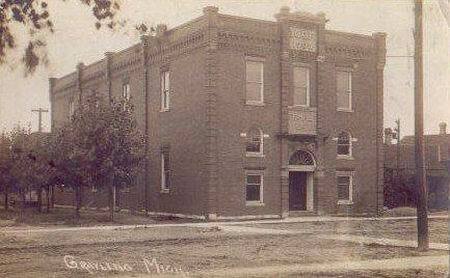 The IOOF Temple Theater was built and dedicated 3 pm Dec. 17, 1908. Fay Bovee remembers the stage and curtains. In later years one photo labels it as a roller rink. It was next a 4 lane bowling alley and then Jansen's Plumbing and Heating. It is located on the I-75 business loop at the corner of Ottawa St. The building is still there today. The address is 109 Ottawa St.